Cello Renda (front right) with the rest of the Prizefighter contestants. Peterborough puncher Cello Renda says he’s been handed ‘the perfect draw’ in ‘Prizefighter’ on Saturday night. Renda was paired with Liam Conroy in the first quarter-final when the draw was made live on Sky Sports News today (February 12). Their fight will launch the all-action tournament at the Winter Gardens in Blackpool and the 29 year-old from Newborough said: “I’m really happy to be boxing first. It’s perfect for me. Conroy comes from Barrow-in-Furness with a record of seven wins from nine fights and of his two losses, one was inflicted by Birmingham’s Max Maxwell. Renda and Maxwell are stable mates, but Renda says he won’t be ringing his pal for any tips before the three-round punch up in front of the Sky Sports cameras. He said : “I’m not the sort of fighter who wants to know everything about their opponents and I’m not reading too much into the fact Max beat him. 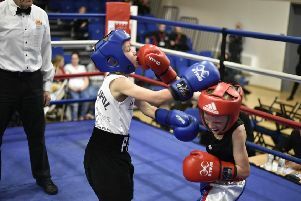 The draw means that Renda, tipped to win the £32,00 top prize by Sky Sports pundit and ex-world champion Johnny Nelson, could face either fancied Dubliner Luke Keeler or stable mate Craig Cunningham in the final. Cunningham, the Midlands Area champion and one of five unbeaten fighters in the eight-man line up assembled by promoter Eddie Hearn, also trains with Jon Pegg in Birmingham. Draw: Liam Conroy v Cello Renda, Jack Arnfield v Mick Hall, Luke Keeler v Luke Crowcroft, Craig Cunningham v Tom Doran. Prizefighter will be live on Sky Sports 1 from 7.0pm on Saturday night.